I discovered Mardou with the second issue of Sky In Stereo, released by Yam Books after the first self-published mini-comic. That book included the scene where Iris – a teenage girl based in Manchester, England – took acid and started to wander, confused but happy in the streets of the city. That free moment, artfully depicted by Mardou, could have been a fugue in a piece of classical music or a solo in some rock song and it made me realize I was staring at a sharp and genuine talent with an unique ability to write dialogue and to render body language. After locating and reading the first issue, my initial impression was confirmed. Iris’s story was once again told with a lightness and a fluidity that seems hard to find, especially when you consider that behind the lightness there are big issues at play, such as love (for her fast-food coworker Glenn), drugs (ecstasy, acid but also heroin) and now, religion. I say “now” because Sky In Stereo is finally back on track with a definitive edition in two volumes published by Revival House Press. The first will be available in October, featuring a 180-page story with an unreleased prologue, the two previously-mentioned mini-comics and the never-published third issue. I read a preview and I talked about it with Mardou. Hello Sacha, since this interview is a sort of preview of Sky In Stereo vol. 1, I’ll leave it to you to introduce the book. Hi Gabriele, Sky in Stereo is a two part graphic novel about a teenager called Iris, her crummy job and school life and her slide into a mental breakdown. It sounds depressing but it’s not. There’s some good times along the way. The first thing that comes to my mind talking about Sky In Stereo is that many parts may seem autobiographical, starting with the fact that the story takes place in the ’90s in Manchester, England, where you grew up. 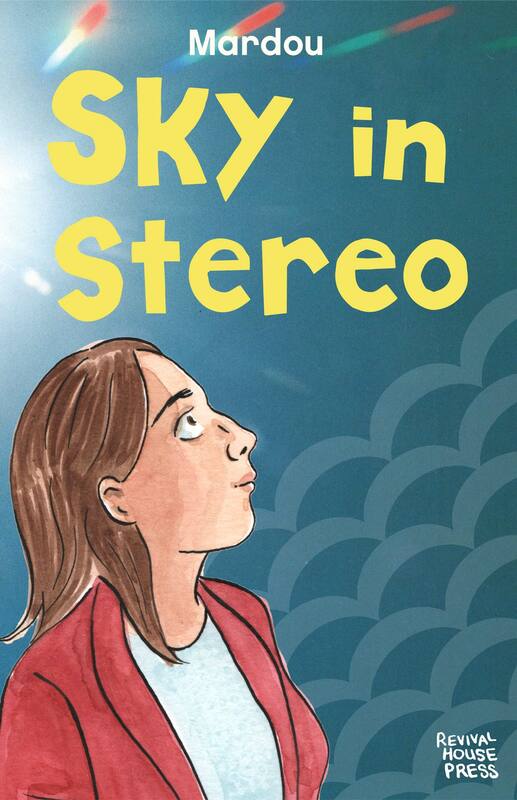 Anyone can speculate about how much of the book is autobiographical… Instead I’d like to ask you if Sky In Stereo takes its cue from some diary, novel or comic you have written and/or drawn during your college years, because some parts seem very accurate and true to life. Nope, I didn’t keep a journal back then. Many of the main events are taken from my own life but I made a choice to turn this into fiction. Plus you know, this material goes a long way back, over twenty years. I can’t remember conversations from that long ago, so it becomes invention. Fiction gave me much more freedom to explore true things from a different angle and also compress the unwieldy aspects of real life into something simpler, a story with its own arc. Many characters are made up, Iris’s stepdad Doug for instance. My mum was married to a guy but he was very different to Doug. I really like that character actually, he was fun to write and the bickering between him and Iris’s mum really helped reveal aspects of Iris’s decisions in the story. My own mum IS a Jehovah’s Witness in real life but she’s not like Gina. Gina’s quite staunch and conservative. It served the story to make her that way. My mum in real life is lovely and I have a pretty close relationship with her. Always did. I’m glad the story seems real though. I wanted it to be relatable. Thanks. When we get older I think we dismiss and forget how intense young love is. I was hoping to capture that intensity of feeling and futility. With regards to the first part where you’re exploring the family environment and the religious education of Iris, these scenes were never published before. In fact, Sky In Stereo # 1 opened with what is now the second chapter where Iris is in the car with her friends before entering a club… Why have you added it in this edition? It was always the plan, I just thought it would be more interesting to start the mini-comics in the heart of the action, rather than deal with the backstory. In the second book (it’s all thumbnailed and ready to be penciled and inked this autumn), the religious stuff becomes a theme of Iris’s time in the psychiatric hospital. In fact the original manuscript I wrote was huge, it went back even further to when Iris was seven years old and her parents were divorcing. The story we have now emerged in the editing. I chopped off two whole chapters, about 100 pages, which had even been thumbnailed and felt great about it. “Yay, now I don’t have to draw all this stuff!” The book is better for it. An important moment is when Iris is reading Jean-Paul Sartre’s The Age of Reason and her religious beliefs fall apart. I found this very appropriate, a lot of people in their teenage years question the teachings passed down from family and society after approaching some novel or philosophical text. Yep. I read a really key book, Confessions of a Teenage Jesus Jerk by Tony DuShane and that happens to him, exactly. He was spurred into rocking the boat in his Jehovah’s Witness family by reading a book of ill-repute. I read this book after I written Sky in Stereo, but it really spoke to me. The day after that’s how she feels, she feels special and buoyant. But the days that follow she’s not slept or eaten even… The euphoric confidence doesn’t last. Can’t last. Yes, the second book is the same length, deals with Iris locked up for the summer. There’s a three-page excerpt at the end of this book, it gives you an idea of what lies ahead. I was quite influenced by The Bell Jar by Sylvia Plath. Iris listens to a lot of ‘90s music, there are references to Pixies, Blur, Pavement, Nick Cave, Orbital… But there are also David Bowie and The Velvet Underground… What did you listen to in your college years? All that stuff. Except Orbital. Techno and Dance music was still huge in Manchester even though by the early ‘90s it had peaked. I was never into those scenes. That Pulp song Sorted For E’s & Wizz was so true, not for me, but I’d see that culture around me. I remember reading a ‘90s interview with Nick Cave saying when he tried Ecstacy he got into a fist fight with someone. Ha ha, that’s my man! And what about The Smiths? I don’t know if you liked them, but there are some moments that remind me of Morrissey’s lyrics. For example, when at the end of the first chapter, Iris thinks “He was my first… Being young feels like a curse. All this time ahead of me… Blank and grey”. And they’re from Manchester like you. They were a bit before my time and I was never a fan. Johnny Marr’s guitars always jangled my nerves. I like Joy Division and New Order, who also were important Manchester bands. When I was in high school the Happy Mondays and James were really big. I think the point is, the book is set in Manchester and music is somehow integral to the city. It was a place to see bands and great bands came from there. It gave this otherwise unimportant city a sense of itself. It’s hard to explain but I was trying to make music part of the weave of the book the way music is woven into the city Manchester’s culture. Stepping back, I initially discovered your work with the Sky In Stereo’s minis, but I know that you published a lot of comics before, such as Anais In Paris and Manhole. I saw a few stories online from the all-girl anthology Whores of Mensa and they are short and funny, yet very different from Sky In Stereo, where you’re focusing on storytelling. Is there any artist that influenced you while doing your early comics? Dan Clowes and Julie Doucet were two. But they were both such great artists. I figured out that writing was my strength so finding a style of drawing that would serve my stories was my long term goal. It still is! I’m much more comfortable with my art now, I think that shows. Discovering Gabrielle Bell’s work about ten years ago was really important to me. Not that I’m trying to ape her, but that there’s this comfortable flow in her drawing that was so inspiring to me. She wasn’t trying so hard, she was just being herself. It informed me! I think I’ve unconsciously picked up some things from Ted May, my husband. He’s an incredibly skilled artist, I’m not in his league. But I was looking at the way I draw eyes now and realized that I totally swiped that off Ted. Well, we’re married so I’m allowed I guess. Thanks. I really love her work, and she has such an interesting life. Have you noticed that Gabrielle rarely uses close-ups? She draws full figures or ¾ figures in most of her panels. She reminds me of Ozu, his films were like that. I thought Julie Delporte’s Everywhere Antennas was beautiful. I loved it. And Michel Rabagliati’s Paul Joins the Scouts was amazing. He’s such a great writer and cartoonist. I’m really keen on Melissa Mendes work too. Ted’s next Men’s Feelings comic is in progress so I’m reading bits of that when I sneak over to his desk without asking. It’s really great! I like to go on reading tours of people’s lives, reading everything they’ve done and then their biography or autobiography. I’ve been reading Doris Lessing for the past two years. She’s possibly my favorite person ever. Or top five at least. Her book Shikasta is unlike anything I’ve read before. I like John Updike a lot also, people accused him of sexism because he was such a ladies man but actually he wrote women characters incredibly well. I mean, you read Erica Jong’s stuff from the same era and the guys seems so dated and corny. But Updike’s housewives seem real and touching. I read a lot of kid’s books with my daughter. We loved The Borrowers series and we’re just finishing the Moomins novels, Tove Jansson was so great. They’ve influenced my dreams. I dreamed of jewels underwater again last night, so thanks Tove! Speaking of dreams, in Italy we have a famous anchor-man, Gigi Marzullo, who does a nightly tv show where he poses a lot of absurd questions to his guests, like “Is life a dream or do dreams help to live better?”. He closes every interview with the classic “ask yourself a question and give yourself an answer”. So, let’s try that last one! Q- Seen anything cool lately? A- I disturbed two mating ladybugs in my garden yesterday. I was checking my cucumber plants to see if any were ready to pick and found a trysting pair, they’d really tucked themselves away in a private spot against a garden cane, hidden by a leaf. One was yellowish with loads of spots and the female was red with two spots. I thought that was pretty cool.